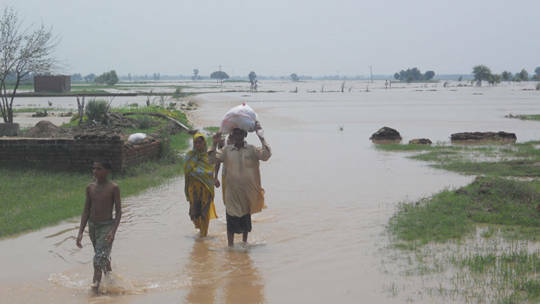 Heavy monsoon rains in Pakistan destroyed thousands of homes, roads, bridges and farms in August 2013 for the third year in a row. Climate change is about large-scale, long-term changes to the earth's climate. In the past, it has happened naturally. But recent warming of the climate is being driven by human activities like burning fossil fuels. These release greenhouse gasses which trap energy from the sun and warm the earth. The United Nations Framework Convention on Climate Change (UNFCCC) defines climate change as a "change of climate which is attributed directly or indirectly to human activity that alters the composition of the global atmosphere and which is in addition to natural climate variability observed over comparable time periods." Why is CAFOD campaigning on climate? Climate change affects our health, our homes, our heritage and our beautiful landscapes. Our community centres where we meet, our sports fields where we play and our places of pilgrimage where we reflect. It also ruins the work we do to fight poverty. Enough. Together as Catholics, we can turn the tide. We can call our politicians to go further and faster with emission cuts. We can treat our common home with respect and choose to live sustainably. How will climate change affect people living in poverty? Climate change affects us all. But it hits the poorest hardest, multiplying hunger, migration and conflict. If you already live on the edge, extreme weather events can push you over into ruin. With no financial or social safety net, a flood that destroys your home can leave you completely destitute. 26 of the 30 countries most vulnerable to natural disasters and a changing climate are also Least Developed Countries (LDCs). It is deeply unfair since these countries have done the least to cause climate change. Why do we need to limit global temperature rise to 1.5°C? We know that to avoid the worst effects of climate change, we must limit global temperature rise to 1.5°C (above pre-industrial levels). The international scientific body on climate change, The Intergovernmental Panel on Climate Change (IPCC), are releasing a special report in October. It will examine the impacts of the earth warming by 1.5 °C and will look at the different ways we can limit temperature rise. Already we are seeing some of the devastating effects of a temperature rise of just below 1°C. Communities in the Pacific islands are on the front lines of climate change. Many are being forced to adapt to ever-changing and dangerous weather conditions or flee their lands. Joseph Moeono-Kolio, a climate activist in the South Pacific, said, "Rising sea levels erode our coastlines and homes. Extreme weather keeps destroying our infrastructure. Rising acid levels in the ocean are ruining our coral and fish stocks – I could go on and on. Our most vulnerable communities feel these impacts the most." Climate change is a global crisis and is already affecting us in the UK. Impacts include more intense heat waves and heavier rain which in turn affect health and agriculture and change flood risk. What progress have we already made? In 2015, 195 countries signed a ground-breaking deal called the Paris Agreement. This agreement was a turning point for action on climate change. It commits countries to limit temperature increase to well below 2°C, and ideally 1.5°C. The UK was the first country to legally respond to the threat of climate change. The Climate Change Act is a pioneering piece of legislation brought into force 10 years ago in 2008, and it commits the UK to reduce greenhouse gas emissions by 80% of 1990 levels by 2050. At the time it was ground breaking. We now know if we are going to limit global temperature rise to 1.5°C we need to be going much further, faster. Renewable energy sources, like wind and solar power, now generate almost a third of the UK's electricity. Is limiting temperature rise to 1.5°C possible? The generations before us eradicated smallpox. Ended Apartheid. Tore down the Berlin Wall. Now is our time to say ‘enough’ to climate change. We know it isn’t going to be easy. To limit global temperature, rise we need to be going much further and faster than we are currently going. It will take everyone: we need change from businesses, in lifestyle, in transport and in government policy. However, we are not alone in this fight. Standing alongside us is a global Catholic community of people with power and of faith demanding change. We are Climate Warriors of the Pacific who are fighting, not drowning. Farmers in Central America who know the earth like we know our own hands. Young people in towns, cities and villages committed to creating a sustainable world. Even though it will be hard, we know it will be worth it to restore our beautiful home. Together we can create a world of cleaner water, fresher air, safer homes for all of us to share and enjoy. What are the links with our faith? God reveals himself to us in nature. The world is a gift from God and its future is intimately bound up with our own lives and choices. At CAFOD we have also been inspired by Pope Francis’ letter on the environment Laudato Si'. It complements what the Catechism of the Catholic Church says that our responsibility as good stewards of creation is to care for our world and not ‘steal’ resources from future generations. In Laudato Si' Pope Francis speaks openly about the devastating effects of climate change on people and the planet. He says that climate change is real, urgent and it must be tackled. He also describes the climate as "a common good, belonging to all and meant for all". He calls us to an ecological conversion and invites us to praise God for the gifts of creation. Explore Pope Francis’ message in Laudato Si’ with your parish or school. Find resources to help you do this. What’s CAFOD’s campaign asking for? To limit global temperature, rise to 1.5°C we know that we need to go further, faster with our emissions cuts. Even if countries met all their obligations under the Paris Agreement, to reduce emissions, we would still have 3.2°C of warming. To stop temperatures from rising, we will need to make sure that the emissions we put into the atmosphere are no greater than the ones we remove (e.g. by planting more trees, which take in carbon dioxide as they grow). This is called 'net zero emissions'. To stand the best chance of keeping below 1.5°C, we need to be at global net zero emissions by 2045. CAFOD is calling on the government to make sure that it sets a net zero emissions target by 2045. Doing so would show strong international leadership and send a signal to countries, businesses and civil society that we need to be going further and faster with our emissions reductions. Several countries have already committed to reach net zero emissions before 2050. These include Sweden, France, New Zealand, Costa Rica, Norway, Bhutan, Iceland and Portugal. What do we mean by ‘net zero emissions’? Net zero emissions is achieving a balance of emissions so that we only produce the same amount of greenhouse gases that we take in. This means that, on average, we are not releasing any additional harmful emissions into the atmosphere because we absorb the same number of units of greenhouse gases that we put out. It is impossible to emit zero emissions but net zero means that what we do produce is cancelled out through planting trees and plants, for example, which take in carbon dioxide. When do we need to reach net zero emissions? We are asking the government set a by-2045 net zero greenhouse gas emissions reduction target. This is based on the science behind keeping global temperature rise below 1.5 and what is fair and equitable. How is the UK government responding to the issue? After the UK signed the Paris Agreement in 2016, then Energy Minister Andrea Leadsom said: “we will need to take the step of enshrining the Paris goal for net zero emissions in UK law. The question is not whether but how we do it”. In April 2018, Claire Perry, Climate Minister committed to seeking advice on a target from the Committee on Climate Change (an independent advisory body on climate change). Simon Clarke MP, together with 127 MPs, have signed a letter to Theresa May asking her to back a UK net zero emissions target ahead of 2050. How can I cut my own emissions? There are so many ways you can reduce your individual carbon footprint, whether it’s through cutting down on your energy consumption, for example installing insulation, switching to a green energy provider, or making sure you turn off your lights when you leave the house. Or through your chosen mode of transport, by committing to one car-free day a week, having a ‘staycation’ rather than flying abroad, or taking up cycling. Whichever way you decide to tackle climate change, remember small actions can have big impacts, not only on the environment, but on the welfare of our brothers and sisters across the globe. How will we benefit from net zero emissions? A net zero emissions target, fully implemented, will cut energy bills by improving the efficiency of our homes and businesses, it will get rid of the exhaust pipe emissions that pollute the air we breathe, and it will help to bring about the restoration of our natural habitats, so they become stores of carbon, from forests to peatlands. We can have a greener Britain with cleaner air – and by making a clean break from harmful emissions, we’ll be sending a signal to our friends and allies around the world that Britain is shouldering our responsibility and leading the fight against climate change. What difference will the UK's efforts make? Especially as the USA has pulled out of the Paris agreement? It's true that no single country’s emission reductions will make a difference on its own, it’s only if every nation agrees to limit polluting greenhouse gases emissions can we achieve the cuts we need on a global scale. The UK is responsible for about 2 per cent of the whole world's man-made carbon dioxide emissions. The UK also plays a large role in global climate leadership, raising ambition levels at EU, and international decision-making levels, as well as in meetings such as UN Security Council and the G7. In 2008, the UK showed leadership by introducing the Climate Change Act. It became the first country in the world to introduce legally binding targets, and other countries followed suit. By introducing a net zero target the UK can send a message to other countries that they should to! President Trump’s announcement that the US will withdraw from that agreement was met with dismay from heads of states around the world. They made it clear that they will reject any attempt to derail global efforts to tackle climate change. It resulted in citizens, businesses and mayors in the US and global leaders around the world reaffirming the need for urgent action on climate change. Is CAFOD working with other organisations? CIDSE: a European group of Catholic organisations, who speak with a united Catholic voice in UN climate change negotiations. CIDSE works through its members in different European countries, Bishops’ Conferences and partners in developing countries. CIDSE will have a presence at forthcoming UN climate talks. Caritas International: which works with national Caritas organisations around the world, Bishops’ Conferences and southern partners to speak out on global issues. GCCM (Global Catholic Climate Movement): a global network of over 200 Catholic organisations working to respond to climate change. 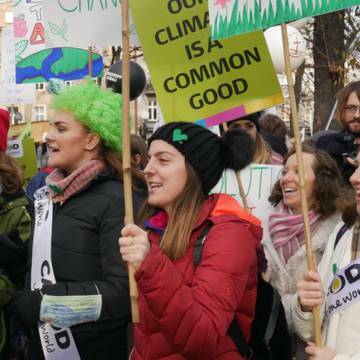 We also work with The Climate Coalition: which brings together over 100 organisations, from environment and development charities to trade unions, faith groups, community and women’s groups.